The original architectural finishes and details of this mid-century Singapore apartment were once hidden beneath decades of dust and grime – however it has now been sensitively restored to last another 50 or more years. Interior designer Eugene Yip recycled 100% of the original herringbone-design timber floor, white mosaic floor tiles, wrought-iron swing windows and grilles, metal gates, etc, and added carefully-considered new design elements to give the space a vintage-modern charm. The original architectural finishes and details of this mid-century Singapore apartment were once hidden beneath decades of dust and grime - however it has now been sensitively restored to last another 50 or more years. 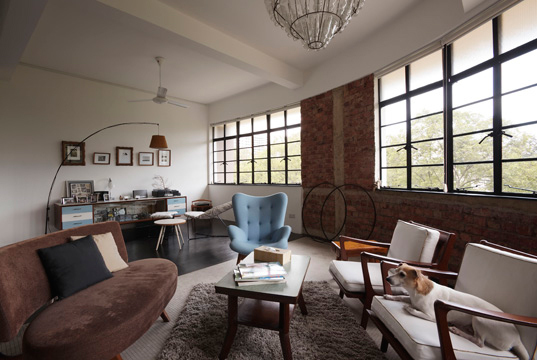 Interior designer Eugene Yip recycled 100% of the original herringbone-design timber floor, white mosaic floor tiles, wrought-iron swing windows and grilles, metal gates, etc, and added carefully-considered new design elements to give the space a vintage-modern charm.